James F. Nooney concentrates his practice in areas of business and professional liability. 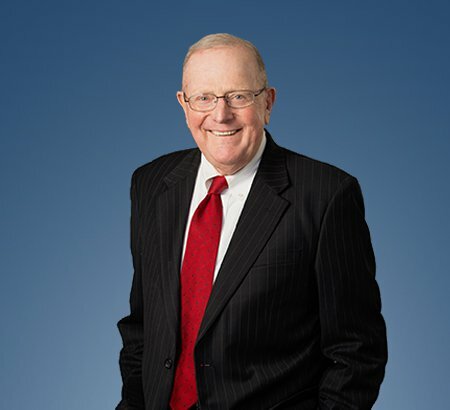 Before joining the Firm in 1971, he served four years as a staff judge advocate in the United States Air Force and, during the same period of time, was a part-time law clerk for Kent County, Delaware Superior Court Judge William J. Storey. Mr. Nooney is an of counsel attorney with Eastman & Smith. Mr. Nooney has represented physicians in all specialties, podiatrists, chiropractors, hospitals and nursing homes in a variety of professional liability and credentialing litigation and administrative proceedings. He has successfully defended numerous medical malpractice claims against cardiologists, emergency physicians, neurologists, cardiothoracic surgeons, endocrinologists and vascular surgeons, among others. Mr. Nooney has been a presenter at professional seminars sponsored by the Toledo Bar Association, Ohio State Bar Association, Lucas County Academy of Medicine, Ohio Society of Anesthesiologists and the American Society for Clinical Pathology. Mr. Nooney has been active in national, state and local bar activities as a member of the Ohio State and Toledo Bar Associations, serving as president of the Toledo Bar Association in 1999-2000 and formerly as chair of its Common Pleas and Court of Appeals Committees and chair of its Pro Bono Advisory Board. He also was, for many years, the prime Toledo member of the Association of Defense Trial Attorneys, as well as a member of the Defense Research Institute and of the Ohio and Toledo Associations of Civil Trial Attorneys, having served as the inaugural president of the Toledo group. He is a fellow of the Toledo and Ohio State Bar Foundations, and a master emeritus and past president of the Morrison Waite Inn of the American Inns of Court. For many years Mr. Nooney was a trustee of Abundant Life of Perrysburg, Inc., a non-profit housing facility for low income senior citizens sponsored by Zoar Lutheran Church and operated under a regulatory agreement with the United States Department of Housing and Urban Development (HUD). He also is a member of the Rotary Club of Perrysburg and trustee of the Perrysburg Rotary Service Foundation. He is the previous recipient of the University of Toledo College of Law Alumni Association Distinguished Toledo Lawyer Award and of the Toledo Bar Association Robert A. Kelb Distinguished Service Award and is currently listed as one of Ohio's "Super Lawyers" and has been selected by his peers as one of The Best Lawyers in America® in the specialties of Bet-the-Company Litigation and Commercial Litigation.